A convenient way to understand pulse combustion spray drying is to contrast it with conventional pressure-nozzle spray driers. In a nozzle-type spray dryer, the liquid is atomized by accelerating it through a tiny orifice at high pressure. The atomized droplets then decelerate through warm, low-velocity gases, giving up moisture over a time period of 15-30 seconds. In pulse combustion spray driers, however, the gas and liquid environments are reversed: the very hot drying gases are accelerated to about 300 mph in a resonating pulse combustion engine, while the liquid is pumped into this gas stream at low pressure (about 1 psi) and very low velocity. The high-velocity pulse wave fronts instantly atomize the liquid and drying is completed in less than a second. The rapid drying is caused by extreme temperature differentials and intense mixing in the highly turbulent environment downstream of the combustor tailpipe. Air is pumped into the spray drying unit’s outer shell at low pressure, where it flows through the patented unidirectional air valve . The air enters a tuned combustion chamber (a “Helmholtz Resonator”) where fuel is added to the spray dryer. The air valve closes. The fuel-air mixture is ignited by a pilot and explodes, creating hot air pressurized to about 3 psi above combustion fan pressure. The hot gases rush down the spray dryer’s tailpipe toward the atomizer . The air valve reopens and allows the next air charge to enter. 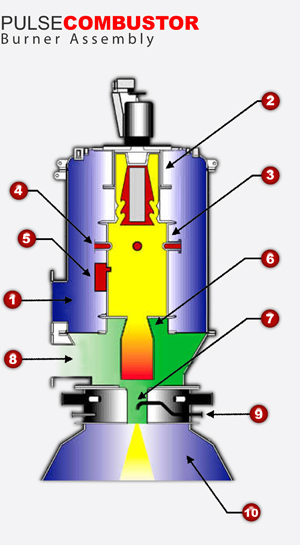 The fuel valve admits fuel, and the mixture explodes in the hot chamber. This spray drying cycle is controllable from about 80 to 110 Hz. Just above the spray dryer’s atomizer, quench air is blended in to achieve desired product contact temperature. The exclusive PCS atomizer releases the liquid into a carefully balanced gas flow, which dynamically controls atomization, drying and particle trajectory. The atomized liquid enters a conventional tall-form drying chamber . Downstream of the spray drying process, the suspended powder is retrieved using standard collection equipment, such as cyclones and baghouses. The main differences between pulse and conventional spray dryer units are in atomization and heat transfer; the differences are dramatic.